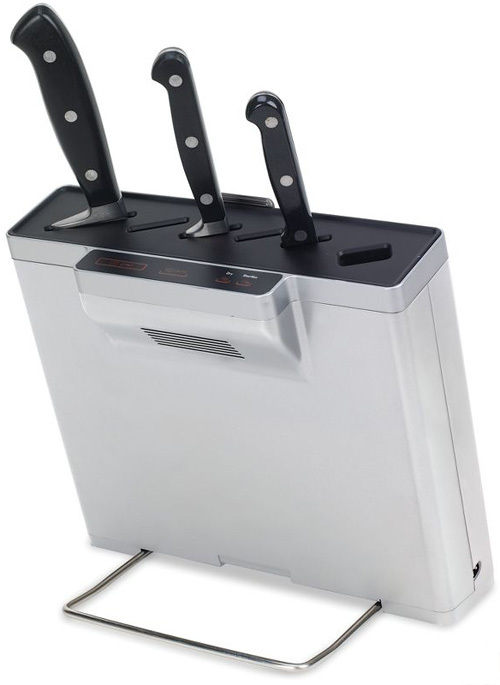 Keeping with today’s “kitchen theme,” is a digital knife block that engages in a little germ warfare. Cross contamination can often happen in the kitchen and some residual germs can not only taint the taste of a good meal, but make someone down right ill in the process. So, it becomes important to kill the little buggers any way you can. And the Germ Eliminating Knife Block is a very useful tool to insure that food preparation is as safe as can be. How does the Germ Eliminating Knife Block do it? It bombards kitchen knives with 20 second burst of UV light in order to kill any residual germs. And as an added safety benefit, the UV treatment also dries the knives directly in the block since since the heat from the UV-C bulb is hot enough to evaporate any residual moisture. Options include time shifting, where knives can be sterilized every three hours, or instantly upon placing the blade into the blocks. And it’s stylish silver and black design will make it look really nice in today’s modern kitchen designs. The Germ Block contains give slots which will sanitize knives up to 8 3/4″ long from tip to bolster, killing pathogens like salmonella, listeria, and staphylococcus, thereby putting an end to cross contamination and food-borne illness. Hat Tip – Hammacher via Oh Gizmo!